PandaTip: “Product marketing” can refer to: marketing of a traditional retail product/good, or a type of online marketing that focuses on product promotion and the bottom of the funnel. The second is more common, especially in recent years. This proposal is designed to work for both, but the examples are geared more towards online product marketing. PandaTip: This is designed for a marketing/consulting company, referred to as [COMPANY], who is sending a proposal to a client, [CLIENT]. If you are an independent consultant and/or do not have a business name, you can replace [COMPANY] with your own name and remove mentions of “group of marketing professionals”, etc. PandaTip: The content in this template is for sample/instructive purposes only. Be sure to write your own content to give your clients a sense of your writing style and the unique understanding and potential approaches you bring to their particular issues. This is written with a more traditional/professional company in mind, but feel free to adjust the overall tone to match your client’s style. Marketing a new product or service in today’s highly competitive environment can be a challenge to any new or old business. The volatile condition of the market and a highly informed and spoiled for choice customer base in the [AREA OR SECTOR], make it a specialized task to position your brand for both maximum visibility and enhanced respect among the customers. We are a group of marketing professionals providing quality services to businesses in [AREA OR SECTOR] for the past [NUMBER OF YEARS]. We provide custom made marketing strategies and services for your brand in accordance with the vision of your company and its goals. The results are an enhanced market presence for your brand and a significant return on your investment as our growing list of satisfied clients will bear witness. It would be our honor and pleasure to work with your prestigious company in marketing your products to a wider customer base. An upcoming [EVENT] at [EVENT LOCATION] provides a significant marketing opportunity for the [COMPETITORS]. Given a chance, we can prove our value for your company by producing and delivering a specific marketing plan aiming to reach the highly influential customers expected to attend the event. Please take a moment to go through our attached business proposal to find out the value our collaboration promises to bring to your business. Looking forward to hear from you soon. Launching your brand or services can be a daunting task in today’s business environment. Competition is fierce in almost every trade. To carve out your own niche in a highly competitive market, you need to align your business plan with your marketing plan from the get-go. 1) Detailed identification of the target market and the best way to approach different segments. For example, a product or service aimed at college students shall be best served by a marketing campaign targeting seminars and webinars at educational institutes, cell phone messages, educational websites, book fairs, promotional events at libraries and colleges etc. 2) Formulation of custom made messages for the identified methods of delivery. The messages have to be tailored to catch the eye of the customers and must be positioned suitably to reach the potential clients. The messages in both a comprehensive or basic marketing campaign typically include product packaging, slogans, sales presentations, promotional text for flyers, brochures and point of sale material, website content, copy for print, electronic media and web advertisements, press releases and articles. 3) The production and execution of different forms of marketing messages involves extensive working with text, ideas, materials and vendors, making it a time consuming and focused activity on its own. Producing paper or plastic print media messages in the form of advertisements, brochures, flyers, billboards, product packaging, electronic media advertisements, web development, search engine optimization, are just a few examples of production and execution of the elements of a marketing plan. Whether your small business is launching a new product or service, reviving a brand, reaching out to your customers or simply trying to expand your customer base, we have a number of highly satisfied clients around the globe belonging to diverse sectors like technology, food items, financial services, luxury furniture, clothing, construction and general business services. Our clients’ continued and long standing associations with our company are testimonies to our efficiency, skills and reliability. By partnering with our firm in taking care of your marketing needs, we ensure a significant expansion of your returns and growth in business. Our extensive knowledge of the marketplace and experience of the trends over the years enables us to produce comprehensive reports on your product/service’s current market position and expected projection as we provide recommendations for future. position your product to enhance its prestige and desirability, ensure long term and sustainable success of the brand by constantly reviewing the results and revising specific strategies. We believe in extensive and continued consultation with the clients before producing a campaign or promotional message. Our marketing campaigns are essentially aligned with the client’s business plans, their goals and strategies since we aim to serve as a veritable arm of the client’s business. 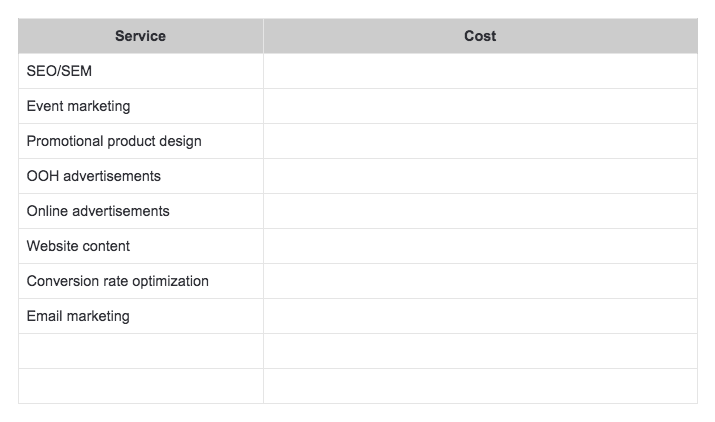 PandaTip: Product marketing clients will be very metrics-focused and typically have a web-based product, so adding a table will help organize the KPIs that you’ll be helping them with. [COMPANY.Company] is a comprehensive, integrated marketing firm and consultancy, based in [COMPANY.Company], covering the [LOCATION] area. Our top management consists of highly experienced and qualified marketing professionals having years of specialized marketing experience in different sectors. Founded in the year [YEAR FOUNDED], our company has provided marketing services to a growing list of highly satisfied clients, a majority of whom are market leaders in their sectors. Our success as a marketing partner was recognized in [IDENTIFY SPECIAL ACHEIVEMENT OR RECOGNITION]. PandaTip: You can provide individual profiles of your team here, along with pictures if desired. The team profiles should highlight their individual skills and experience. If you are a one person company, it is possible to combine this section with the company section. PandaTip: If the pricing is not a simple flat fee, hourly fee, or a monthly retainer, and you have various package options you want to offer or break down into an itemized list, a PandaDoc pricing table or an Excel spreadsheet addendum would be best. Prior to a contractual agreement, proposal may be amended upon collaboration with the client, [CLIENT.FirstName][CLIENT.LastName], at the discretion of [COMPANY].